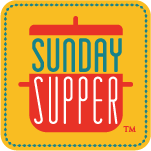 Root vegetables are the star of this week's #SundaySupper! I love all kinds of root vegetables, most of them mashed in some way, but this sweet potato pancake recipe is so delicious, and a great way to use a vegetable in a breakfast food, but don't forget what a great side dish this can be with a bit of horseradish cream. Yum yum. I love these because you can make roasted sweet potatoes for dinner, make a few extra, and have these pancakes for breakfast! If you leave out the seasonings, this becomes a 2 ingredient pancake! Woo hoo! Scoop out the potato flesh from the skins. Beat in two eggs, mixing well. Heat skillet to medium high heat. Coal skillet with oil, butter or spray (spray away from the fire!). Scoop 1/4 c batter and pour onto the hot skillet. Cook 5-7 minutes. These pancakes do not produce bubbles, so you do have to rely on a timer. Turn, cook on the other side for 5 minutes. Enjoy with maple syrup, almond butter, peanut butter, nutella. They are good! Yum! 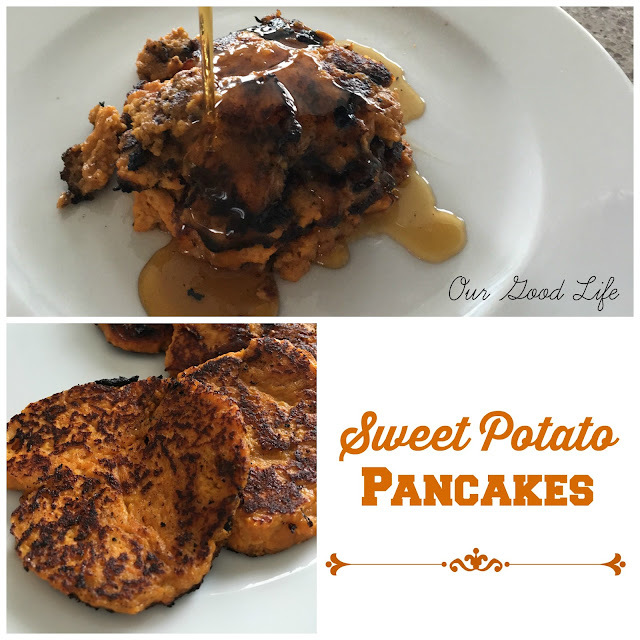 I love pancakes as is, but adding sweet potatoes sound delish! I have to try these the next time I have leftover sweet potatoes! Love potato pancakes. Will have to give this a try. I'd pick these over a regular potato pancake 9 out of 10 times! So yummy! Love this idea! My husband loves sweet potatoes and I know he'd love this. Such a clever variation on a potato pancake! Oh wow so simple! I wonder if my son would fall for these as "cake"
Oh yeah, baby! Love me some potato panckes. And that they're sweet potato make them even better. I made something similar to these a few weeks back! INSANELY GOOD! Sweet potato is one of my new besties!!! Ooooh! These pancakes look great!